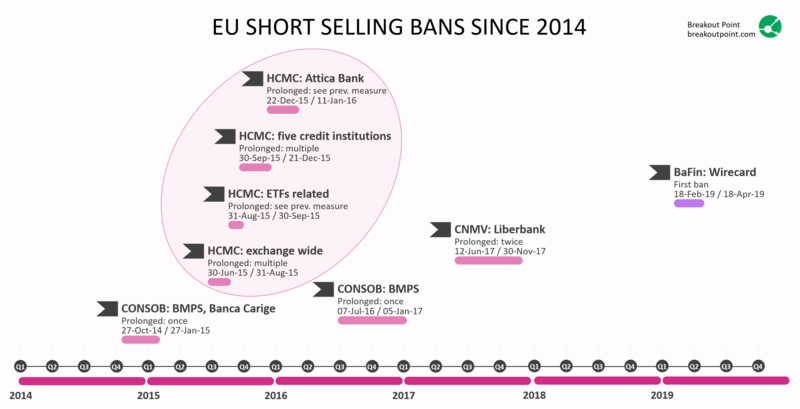 With Wirecard short selling ban expiring on April 18, we looked into all EU short selling bans since 2014 that we could identify. Interestingly, all of analyzed EU short selling bans were extended, in one or other way, at least once. Short selling in Liberbank (CNMV, Spain) was initially banned for period 12 Jun 2017 - 12 July 2017, and subsequently extended twice. The first time until 12 September 2017 and the second time until 30 November 2017. Short selling in BMPS (CONSOB, Italy) was initially banned for period 7 July 2016 - 5 October 2017 and then prolonged once until 5 January 2017. In terms of number of short selling ban extensions, Greece stands out: initial exchange-wide short selling ban from 30 June 2015 was extended five times, then, immediately after that, an alternative emergency measure (ETF-related short selling ban*) was implemented. This was followed by a short selling ban in five credit institutions, which also got extended a couple of times. Finally, from five credit institutions, the short selling ban was reduced to only one, Attica Bank, and measure came to an end in January 2016 with ESMA issuing a very rare negative opinion on the renewal of the short selling ban in Attica Bank. This is the only such negative opinion by ESMA that Breakout Point came across during our evaluations. Short selling ban in Wirecard entered into force on 18 February and is applicable until 18 April. After that, the ban will be lifted or extended. We briefly look at factors that EU regulators considered when facing similar situations in the past. Share price: How did price of shares develop during the ban? How does this compare to performance of the relevant (national or sector) index? How does the performance during the ban relate to share price declines prior to the ban? Volatility: How high is volatility? How does it compare to the volatility of the similar shares and to the historical volatility preceding relevant events? Short interest: What happened to the short interest during the ban? By how much did it decline? Borrow activity: What happened to the number of borrowed shares during the ban? Big increase of shares borrowed could indicate significant borrow with intention to short sell immediately after the ban is lifted. Don't want to miss the latest short selling moves by big players? Join Breakout POINT. Access data and our analytics. * Note: This particular emergency measure has not been extended, but it represents a direct continuation of the previous measure.